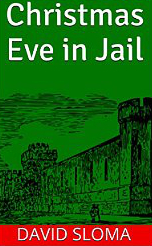 A new short story of mine is available “Christmas Eve in Jail.” I got the idea for it on Dec 24th, 2013 and now here it is! Cal was in prison, again, at Christmas time but he’s not without hope. A short story to warm the heart for the holidays. (Special for the holiday season, only $0.99! Regular $2.99.) Merry Christmas! Also available as an ebook from Apple iTunes, Google Play, Barnes & Noble, Kobo, Scrollmotion, and more. All original content is copyright ©2010-2018 David Sloma. All rights reserved. New Novel: "The Key to the Lock"
This site is part of the Amazon Associates Program and third parties (including Amazon and other advertisers) may serve content and advertisements, collect information directly from visitors, and place or recognize cookies on visitors’ browsers. We may track visits, including IP addresses and referring links.